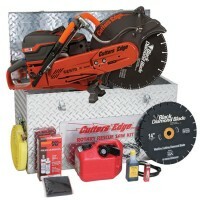 Cutters Edge Rotary Rescue Saws feature new X TORQ® technology utilising Dual Intakes that split airflow into one fresh-air stream and one clean-air stream for the fuel-air mixture. The fresh-air intake forms a barrier that delays the fresh fuel mix from entering the engine while assisting in exhausting the burned gases. Then the fuel-air mixture enters the engine, resulting in more power, higher torque, 75% less emissions and 20% more fuel economy than conventional 2-stroke chainsaw engines. 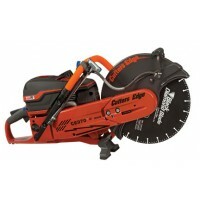 The Cutters Edge Black Star Diamond Rotary Blade last longer than up to 100 standard rotary composite blades. The diamonds are attached to the blade through a vacuum brazing process, instead of the electroplating process used to manufacture other diamond blades.